The Irish government has nominated Mrs Justice Susan Denham as the new chief justice. 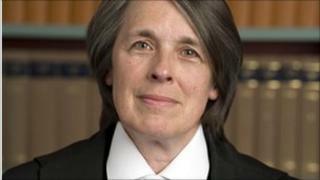 She is the first woman and also the first Protestant to hold the most senior legal post in the Republic of Ireland. Mrs Justice Denham replaces Mr Justice John Murray. She was called to the Bar in 1971 and became a senior counsel in 1987. She was appointed a judge of the High Court in 1991, and was also the first woman appointed a Supreme Court judge. The recent appointment of Maire Wheelan SC as attorney general, means the two most senior positions in the Republic's judicial system are now held by women. From 1996 to 2010 Judge Denham was pro-chancellor of the University of Dublin. In July 2002, Queens University, Belfast, presented Judge Denham with an honorary Ll.D. Judge Denham was the Hon. Sec. of the Committee on Judicial Conduct and Ethics which in 2000 presented a report advising the establishment of a Judicial Council in Ireland. This is a matter which Judge Denham has advocated for over 10 years. Judge Denham was part of the Irish delegation which, with Holland and Belgium, established the European Network of Councils for the Judiciary (ENCJ) and she continues an involvement in this network. Judge Denham is a bencher of the Honourable Society of King's Inns, and an honorary bencher of the Middle Temple in London. Mrs Justice Denham is the daughter of former Irish Times editor, Douglas Gageby, whose father was born in Belfast. She was educated at Alexandra College, Dublin; University of Dublin, Trinity College; King's Inns and Columbia University, New York, U.S.A.